Back-to-School Time: Have You Nurtured Your Student’s Curiosity Lately? Yes, it is back-to-school time for many of the world’s youngsters. In America, late August and early September is when students return to school to meet new teachers who will be entrusted by parents to help educate their children. Have you, as parents, guardians, or mentors nurtured your student’s curiosity this summer? My book on education, learning, and mentoring suggests that successful learning and top student performance stem from a healthy curiosity – the desire to know and understand the world around us. 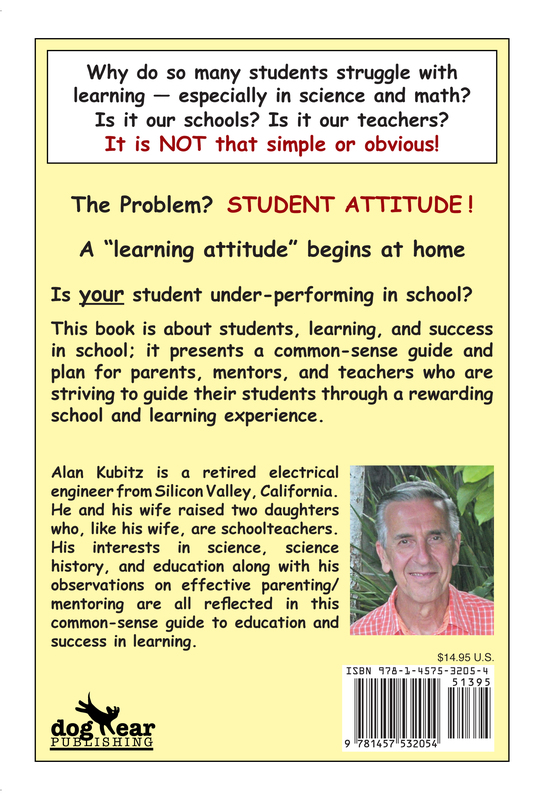 Such a “learning attitude” (or lack thereof) is influenced primarily by the home environment and the adults at home – not by the students’ school and teachers. Equipped with a good “learning attitude” acquired in the home, students prosper at school; without a proper attitude, many disinterested youngsters flounder in class while being easily distracted by social media and the associated electronic connectedness so prevalent today. Sadly, many of these children will, in the course of their schooling, waste the most precious opportunity that society will ever offer them – a good education and a pathway to lifelong learning. It need not be that way, however. 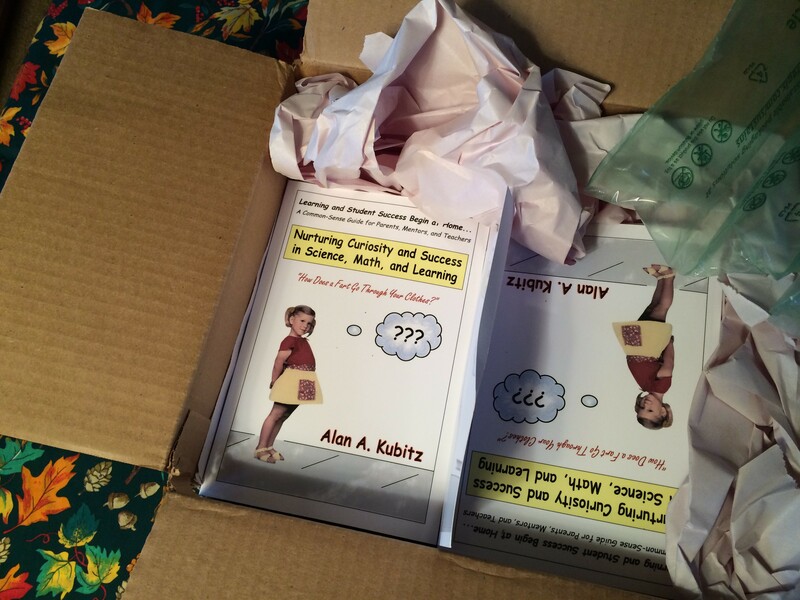 My book is a hands-on, how-to manual for parenting/mentoring with the end goal of insuring school success for students – especially in science and mathematics. 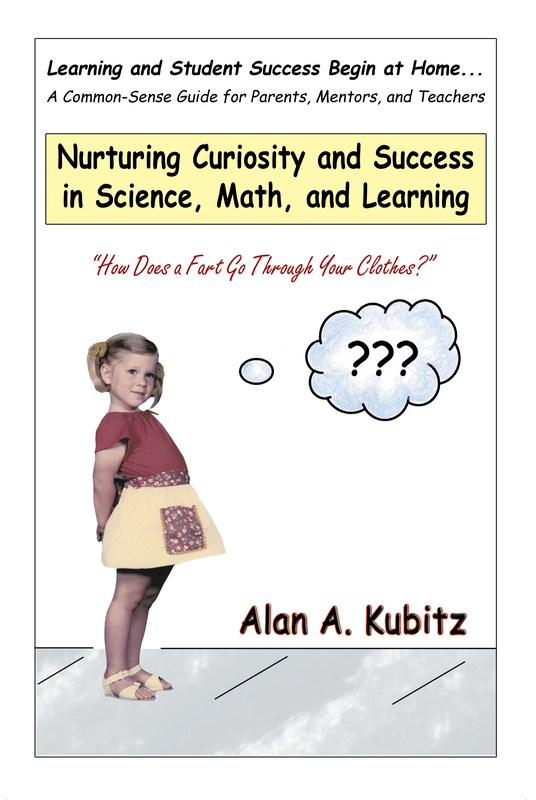 Nurturing Curiosity and Success in Science, Math, and Learning, is available from Amazon for $14.95. This link will take you directly to Amazon and the book. Time for College Admission Letters to Arrive….or Not! This is the time of year when high school students and their parents anxiously sort the daily mail looking for college acceptance letters. This past weekend, Linda and I were in Santa Barbara (California) to celebrate her mother’s ninety-sixth birthday. Ruth still lives alone, cooks, bakes, gardens, and maintains a sharp mind – amazing lady! Among the family members present were Linda’s brother Ken and his son, Owen, who has a key position on the admissions staff of Pitzer College – one of the well-known “Claremont Colleges,” in Southern California. I love talking with Owen, a young man with an out-reach personality which is perfectly suited to his role as a college admissions officer. In addition, he can answer any question on the college admissions process. In the course of our conversations last Saturday, he mentioned that the current acceptance rate for college applicants is 5% for my alma mater, Stanford University, which makes it the most selective school in the country – even more so than Harvard and Princeton. “Good thing I attended Stanford in the early sixties,” I mused to myself. I certainly would not be admitted today! When mulling over my “college conversations” with Owen this weekend, some of my earlier blog posts came to mind: Specifically those having to do with the pressures students face today with the prospect of college and the admissions process. I have provided links to these posts at the end of this piece. When I reflect on the grade pressures weighing on today’s students, I recall my experiences tutoring high-achieving, high school students in science and math, here, in Silicon Valley, California. I will summarize those experiences using an excerpt from my recently published parental guide to science/math education: Nurturing Curiosity and Success in Science, Math, and Learning. This is from Chapter 12 of my book (on the role of outside tutoring). I learned one lesson early in my tutoring experience: Most students who came to the tutoring center had little time for – or interest in – anything having to do with the more sublime, fascinating aspects of physics and mathematics. There seemed to be no sense of historical context and no nascent curiosity about the subject matter itself – not even a sense of excitement over finally “getting it” as problems were solved during the sessions. Most of these kids were figuratively “under the gun” to just solve the problems, get the answers, and run to their next activity. Since most of my tutorees were high school kids enrolled in high-achievement schools, the ultimate axe over their heads was one poor course grade in physics or math which would tarnish their transcript and cripple their chance for admission to a prestige college or university. Students today are under considerable pressure to “succeed” with little time or energy to contemplate and fully absorb the richness of the material they cram or to establish a larger perspective. It became clear to me that professional tutoring, for the most part, has little to do with the concept of academic enrichment. It is much more akin to an “educational emergency room” for students who have experienced course-induced trauma. If you recall from chapter two of this book, the desire to “get the answer and run” is reminiscent of my help-sessions in math with my daughter, Ginny. Here is the point: Parents and students generally resort to outside tutoring, especially in science and math, primarily with an eye to solving homework/exam problems and getting good grades. The main issue with an excessive dependence on that approach, in the absence of true student motivation, is the following: As the material increases in difficulty at each grade level, the curiosity, background and interest requisite for sustaining the motivation required to apply oneself in advanced science/math and to learn the material cannot keep pace with the increasing task difficulty. Soon, this attitude becomes all about merely getting good grades accompanied by the lament, “Why do I need to know this stuff?” At a young age (including high school students) and without sufficient background and perspective to provide the answer to the question they pose, it is not surprising that those students become robotized, learning only the “how to” of the course work while oblivious as to the “why” and the significance of the subject in the larger picture. So, What is the “Take-Away” Message, Here? For prospective parents and parent/mentors of young children already in school or in preschool: Realize that your child’s education and “learning attitude” begin at home, and the earlier, the better. This is especially true for those most problematic of subjects, science and mathematics. The parent/mentor’s role in preparing young students for the future challenges of the college admissions process and the rigors of technical or other demanding careers cannot be over-stated. I suggest to parent/mentors that preschool is the optimum time to begin engagement with your student in order to nurture genuine curiosity and a “learning attitude.” Some parents, even here, in Silicon Valley, are not capable of directly tutoring science and math to their students; I understand that, but all parents must learn how to nurture curiosity and a love of learning in their students – at an early age. Nurturing Curiosity and Success in Science, Math, and Learning: How Does a Fart Go Through Your Clothes? There is one sure way for your student to succeed in school and someday qualify for admission to an upper-tier college or university. The potent factor present in all success stories is….. “curiosity,” that frame of mind which makes learning a delight rather than a chore. Those who travel the “curious” pathway will encounter, along the way, not only learning success, but also the “joy” of knowledge. That is the main theme of my book. Resorting to parental/mentor pressure or threats to limit privileges in order to motivate today’s distracted students just does not work! After reading still more articles and Facebook posts on the all-out competition for grades in the Palo Alto (CA) school system – some of which are literally pleas from students who are overwhelmed – I encourage parent/mentors in this and similar regions of over-achievers to reflect on their definition of “success,” and whether or not that interpretation is realistic and appropriate for their student. Perhaps not. Today has been a special day! After many months of the gestation process, copies of my new book finally arrived. “Gestation” is an appropriate term for use by any author when referring to the birth of a new book and its long-awaited delivery – not by the stork, but by UPS! From initial concept to a tangible book-in-the-hand is a long, hard journey – ask any author – but the satisfaction of finally holding and perusing the end result is worth it all. After publishing my first book on motion physics for the layperson four years ago, I was in no way ready to consider beginning yet another book. However, for both authors and imaginative inventors, a good idea is hard to resist, and the theme of America’s students struggling in science and math relative to students in other countries proved too important and interesting to pass up. More important than national test scores and rankings are the frustrations felt by many parents, guardians, and teachers when their students are underperforming in school. Learning – Especially in Science and Math? Student standardized test scores in science and math are mediocre at best and falling for America’s students relative to many other countries – a rather shocking development. Once I began to seriously reflect upon why so many students are underperforming in school, the reasons quickly became clear to me. Diagnosing the problem was the easier half of the drill; finding cures for the ailing performance of so many of our students proved more challenging, yet I am confident in my ultimate RX prescription for healing our students’ academic woes. The integrated guide and plan I offer as a remedy for parents, guardians, mentors…and teachers, too, is based on common-sense parenting/mentoring and learning principles – many of which have been lost to recent generations. Today’s ubiquitous technology, while often very helpful and even necessary, is also identified as a significant cause of our problems – but by no means the only one. As I wrote the book and solicited comments, one that surfaced more than once went like this: “The parents and guardians who, together with their students, most need the guide and plan you offer in the book, are the least likely to buy it.” I sadly agree, to an extent, but remain confident that many struggling parents and guardians will take advantage of my ideas and suggestions. I envision a very viable market for the book with prospective parents and the parents of preschoolers who wish to be proactive in maximizing school success by providing an early, nurturing environment for their youngsters. Not everyone is initially equipped by nature with the insight required for effective parenting/mentoring. Good parenting is like so many other ventures in life: The best way to proceed is by working hard and by working smart. Highlighting that latter part will prove to be how my book offers the greatest value to parent/mentors. Here, in the United States, achievement test scores in math and science are second-rate and falling with respect to many other countries of the world. Why is this happening? To say that the reasons are several and complex would be a true statement – to a point. A thorough examination of the reasons for America’s declining performance reveals a common-thread: A lack of common-sense in the way we both educate… and raise our children to have a “learning attitude.” A learning attitude and the foundation for success in school comes from home. My upcoming book (available in October), Nurturing Curiosity and Success in Science, Math, and Learning highlights many of the issues at play while offering concrete suggestions to parents, mentors, and even teachers on how to “right the listing ship” of learning at the national level. My book is not primarily concerned with our national achievement rankings, however; its prime focus is on helping parents and mentors at home partner with the schools to improve their student’s school performance and future prospects. The book addresses all aspects of learning and student motivation while paying special attention to those typically troubling subjects, science and mathematics. The important point is this: Some facility with mathematics is crucial to an intellectually rich and materially prosperous life … for most of us. The more math you know, the greater the potential rewards in life, monetary and otherwise. It is our task as student mentors to first convince ourselves that this is true. Only then can we proceed to make a convincing case to our students. Perhaps you have tried simply telling your student that “math is important; you need to know it!”…and that got you nowhere! I advocate a subtler, common-sense approach, appealing to students’ curiosity and their inexperienced instincts by using real-life examples instead of merely preaching the virtues of mathematics for getting a good job someday, being successful, etc. Option 1: $10,000 in cash – paid immediately! Option 2: One penny in cash – paid immediately! But hold-on, there is the proverbial “fine print” attached to option 2: The town banker has consented to hold your penny in the bank and pay you an interest rate on that penny of 1% compounded and applied daily for a maximum of five years. At that time, or any time sooner upon your request, you will be paid the total accumulated amount in cash. A Note on how the “compound interest” in option 2 works: The winner gets one penny at the awards ceremony and promptly deposits it in the town bank. The next day, the penny earns 1% interest (one one-hundredth of a penny) which is added to the original penny. Now the prize is worth 1.01 cents (1 plus 1 times 0.01). The next day, the 1.01 cents earns another 1% interest on itself which makes the total holding equal to 1.0201 cents (1.01 plus 1.01 times 0.01). This continues every day for five years. The $64,000 question: Which option do you choose? If you choose option 1, you will be sorry! Yes, you will have $10,000 in cash in your pocket – immediately. That can buy a lot of neat stuff like computers, stereos, smart-phones, a trip to Disneyland! If, on the other hand, you had an understanding of the mathematics of finance – merely basic math in this case coupled with some mathematical reasoning ability, you certainly would choose option 2, wait five years and collect your $770,000 penny-accumulation! Just imagine what that could buy? How about some Ferrari automobiles, the best college education, a beautiful new home, your future retirement, and/or ….? Of course, it is unlikely the town banker would ever offer such a deal, but the example emphasizes to anyone, the power of mathematics – even the basic mathematics employed above. The calculation involved in this problem is simple, easily done on any student calculator. The solution to the problem – coming up with the right decision – requires a respect for the power of numbers which one obtains given a minimal dedication to the study of math. Here, in this example, is a great illustration of the old adage, “knowledge is power,” and, despite the unrealistic premise of the generous banker presented in option 2, the lesson of this example is not far removed from the many problems recent home-buyers faced due to their poor understanding of mortgage finance and interest rates. We have focused on mathematics in our discussion so far in this chapter and in the above example for no other reason than its importance to science and to a complete education. The lottery prize problem is but one example of a real-world, hands-on, approach which can be effective at generating student curiosity and interest in the possibilities of mathematics. This book will often emphasize the close relationship between science and mathematics while continuing to stress, as well, the importance of math alone in finance, statistics, and everyday life. Appendix 1 in the book illustrates the simple math involved in the problem for the benefit of parents and mentors. – We often look in all the wrong places for ultimate solutions to math, science, and learning problems: “Better” schools, “better” teachers, more class time, and more technology in the classroom are not the ultimate answers. – A “learning attitude” begins at home: Nurturing a real curiosity and interest within students about the wonderful world which surrounds them demands some common-sense insights and practices from parents and mentors. Such an approach is the true key to success. As Albert Einstein once insisted, “I have no special talents. I am only passionately curious.” And he was.